Well it wasn’t what we wanted at all. Our dear Katie cow did not settle to the bull. Lassie and Mischief both went by their return dates. They are in calf to Applejack. Katie returned in heat after we had observed a successful breeding, in fact three breeding attempts had gone by. Ralph and I are pretty upset but Katie is 10 years old and was open when we got her. She had been run with a bull at the dairy. We had asked she be pregnancy tested and had decided to take her even though she was open at that point. 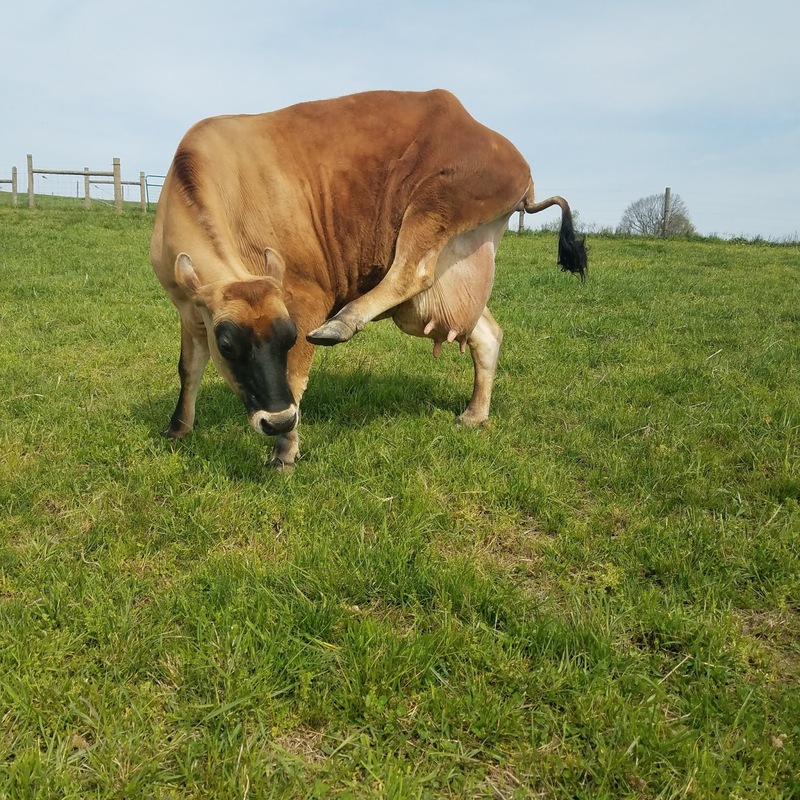 From breeding cattle I know that older cows can be more difficult to get in calf but frankly I fell in love with her when she set foot on our farm. 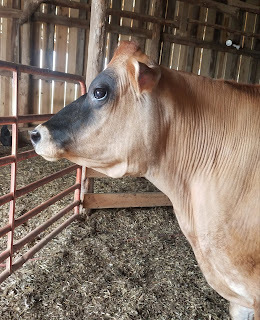 We were optimistic and she milked like crazy and is simply the sweetest cow I have ever owned. So we fed her up, calf shared on her and heat observed and recorded each cycle. Her heats were regular but quiet and after missing standing heat to try to AI her we had decided to go with a bull. That in itself was a challenge. After a lot of back and forth with our Dairy guy, he supplied a bull. Now Katie has fed 5 calves for us and is still milking. Not the 5 gallons a day she arrived producing. The 5 gallons a day that made me question my sanity for getting a Jersey. She is producing 2 gallons a day. 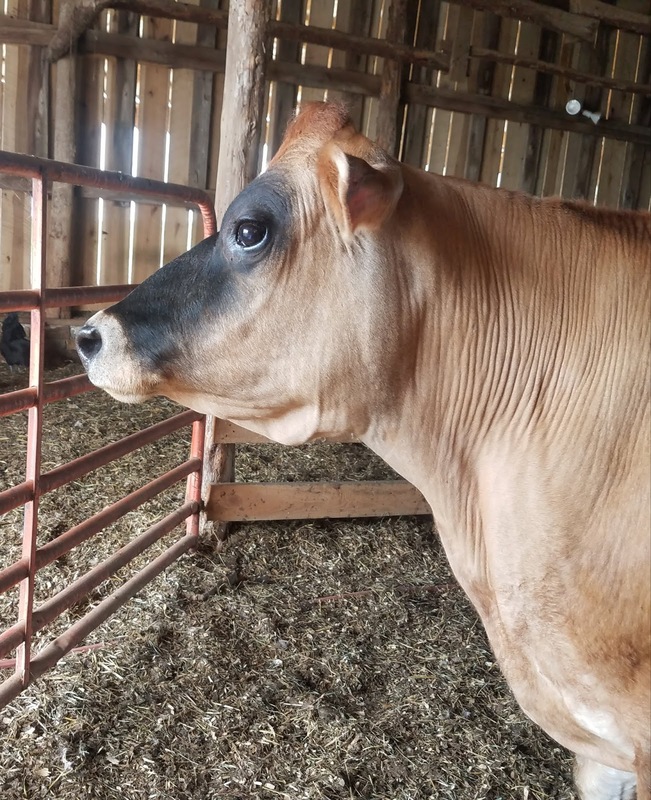 The last calves were quite big enough to wean so after she came back in heat Ralph and I had a long cow talk. 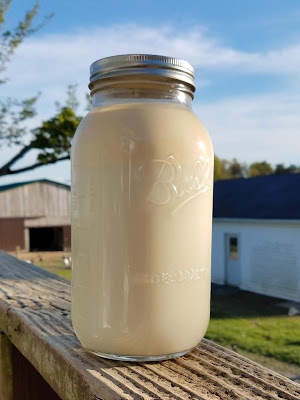 1- How long can a cow milk without a fresh pregnancy and birth? 2- How much milk do we need? 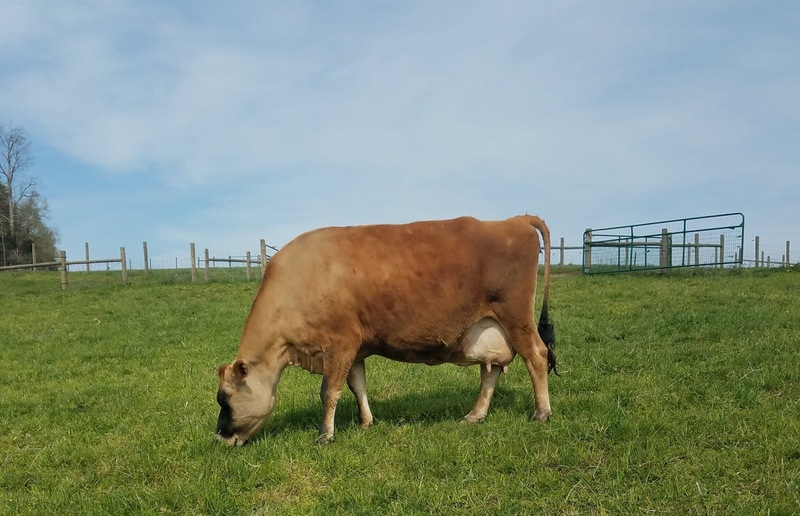 3- How much will Katie continue to produce after 17 months milking? 4- What do we do with a barren cow? We decided to dry off Lassie, she is part of this equation that didn’t quite turn out as planned either. 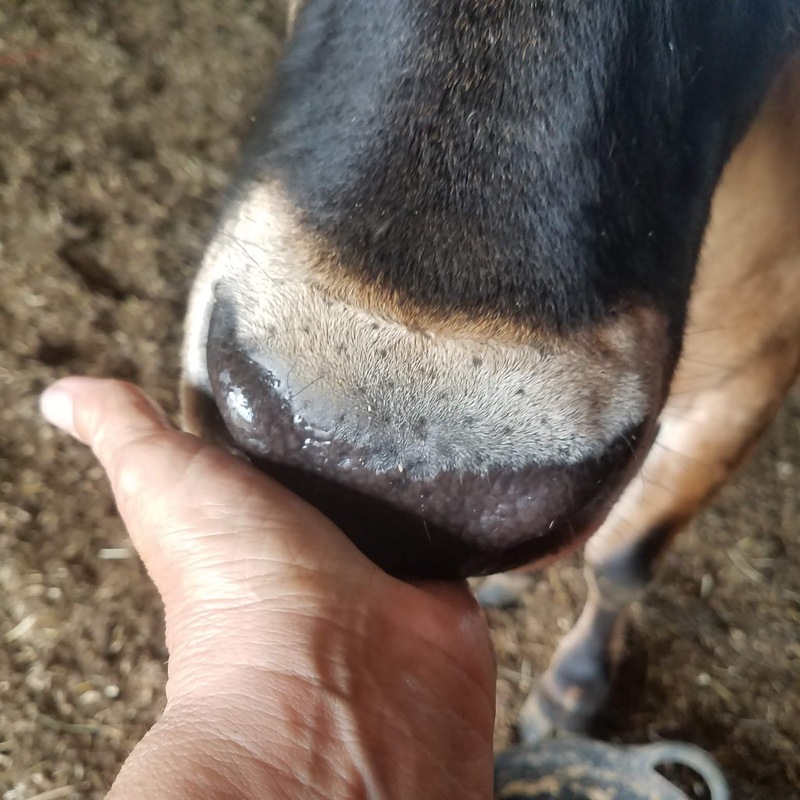 She has never accepted hand milking and kicks worse than a range cow. Her milk is not as creamy as Katies, her smaller teats, great for a surge milker, are not nice to hand milk. (Especially when your trying to milk fast and not get kicked) Lassie loves her calves though and fed her two steers beautifully, they are fat, a rare thing for jersey steers at that age. cow! I know she will not be our house milk cow but it’s fine if she loves calves. So Lassie has her job. Drying her off now will allow her to have a summer on grass to gain weight. From what I have read and what Mike said....Katie might stay in milk for another year or longer. It just won’t be huge production. her it wasn’t as horrific and she has got back into rhythm. She loves her smidgen of grain and I have to admit it’s nice to have a milking schedule again. 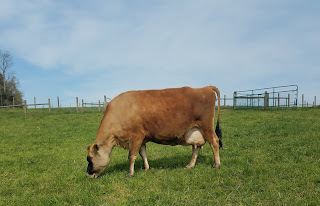 She is a joy to milk and on fresh spring pasture the milk is heavenly, her cream is way up as well. 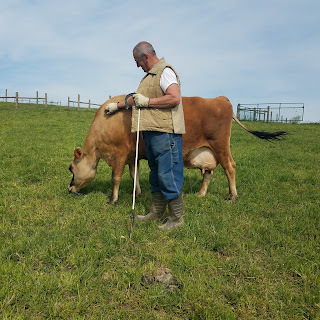 We are going to enjoy our old ‘open’ cow. 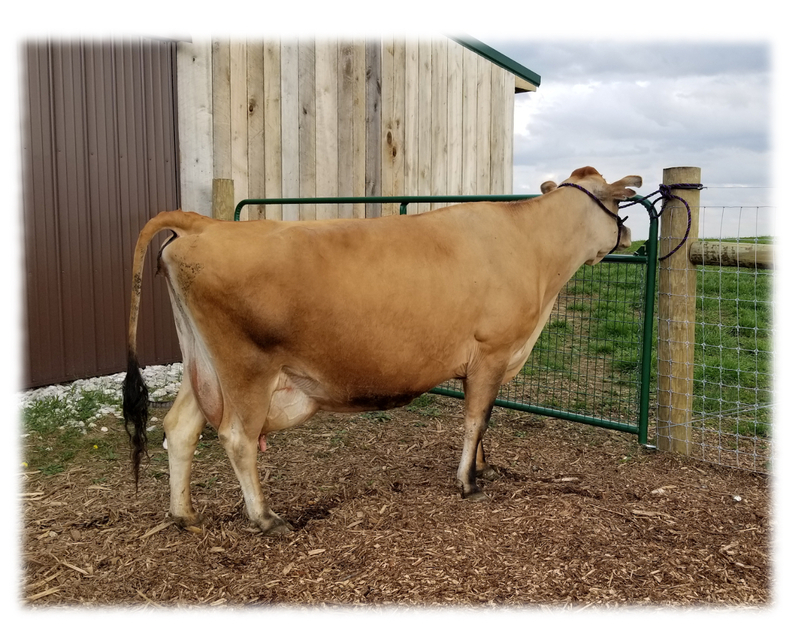 She still has a lot to offer us, the milk amount is plenty and Katie is in great shape, not too fat but certainly not boney. She is not looking her age and after watching her buck the other day....not acting her age either. So here we are, in a bovine dilemma. We fell in love with a sweet set of Jersey eyes. I think we are going to continue our love affair. It’s not like she is actually costing us anything. She is giving us fantastic milk and delightful companionship. I think sometimes animals earn an honorable retirement. Katie’s happens to be a working retirement. Sometimes you make decisions with your heart and that’s alright now and then. In closing I think you might enjoy a montage of Katie moments. 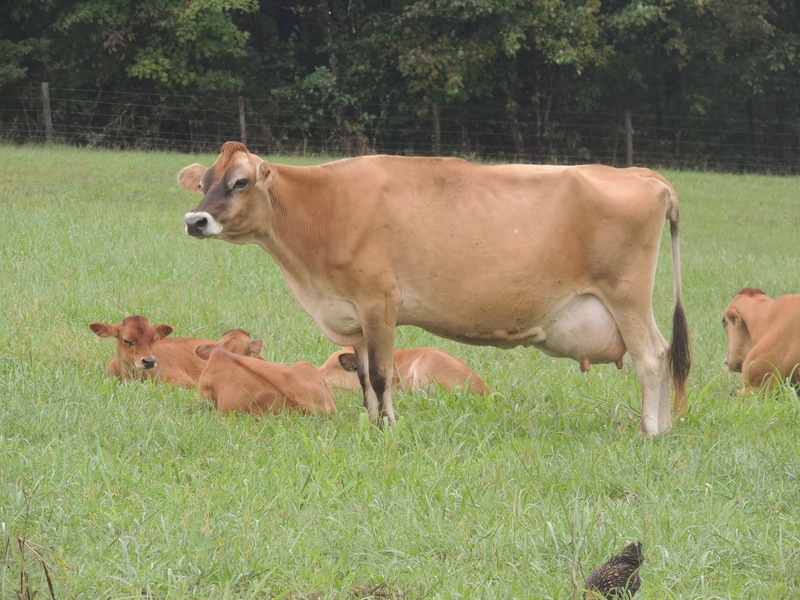 God keep you safe and bless you with a sweet jersey cow at least once in your life! Do any of you watch the Youtube Videos from Prager University? They are very good, well presented and done to educate. They use common sense, facts (that are accurate) and the voice of reason. I subscribe to their Youtube channel and look forward to new videos and a well written newsletter in my email. Topics they present are not politically correct or sugar coated versions of a perfect society. They are however worth watching. When I started to watch them several years ago the occasional YouTube video presented by PragerU would be demoneitized (having advertising revenue removed or not allowed). This occurs when a viewer flags the video as offensive. I have never found any to be anything but good conversation on topics a free country needs to talk about. I didn't agree with all of them, I learned from all of them. Some confirmed my opinion and a few changed my opinion. I was very surprised when Mr. Prager made a video about dealing with Youtube and the censorship they face for presenting the conservative or opposing viewpoint. They get flagged for hate speech and censored heavily. This morning in the morning email, Mr. Prager told of the recent censorship they are working under. They are banned from advertising on Twitter and Spotify. Banned because of an open discourse of ideas. Not hate speech but speech that differs with the left and progressives. PragerU has 100 restricted videos on YouTube. They have 2 active lawsuits against Youtube and Google for restrictions against educational videos. Facebook has removed multiple videos for "Hate Speech" violations. Is this something that should be happening in a country built on the free and open discourse of ideas? The county where Voltaires famous quote comes into play. "I wholly disapprove of what you say- and will defend to the death your right to say it." It has become a world where expressing our honest opinion is not the free exchange of ideas but something else. To me this is a loss on so many levels. How can we learn things if we cannot hear all sides of an issue and the correct information about those sides? If you get a chance I would strongly recommend watching the PragerU videos or listening to one of Dennis Prager's Fireside Chats. We must try harder to save this country and the incredible freedoms it allows us. Freedoms to try things, freedoms to fail and succeed as we live in a country that has opportunity like no other. Opportunity that is being eroded away and censored into oblivion. God Bless all of you and keep safe. Read something uncensored today...keep an open and free mind tempered with honesty, integrity and common sense. Learn new things.